Java spent all day yesterday at the vet. Although I had a nice peaceful day, I did miss her, which is a bit like missing a sore paw really. I heard Bossy tell someone that she was being sterilised. I know that she’s inclined to be dirty (Java, not Bossy), because she’s often covered in mud (and sometimes worse), but I didn’t realise that it was that bad. And anyway, once she’s been sterilised, surely she’ll just jump into the river and roll in the mud and be dirty all over again. When she came back last night she was in a very sorry state; I think that the sterilising machine must have slipped or something because she had a big bandage on her tummy. Also, she cried all evening and couldn’t walk properly and had to be carried to bed. I’m not allowed to practise my judo on her or chew her ears for two whole weeks, which makes me wonder what the point of her is. I hope they don’t take me to the vet to be dry-cleaned because I don’t want to end up like that. She seems to be better today, but I’m not: I’m quite exhausted because I had to comfort her all night while everyone else was asleep *exploited doggy sigh*. Thank you Hugo. I’m sorry that you’re feeling exploited, but it was very kind of you to take care of Java. This soup is packed full of nourishment. The mushrooms provide vitamins D and B complex, as well as minerals such as selenium, magnesium, phosphorus, potassium and copper. The spinach contains high levels of iron, folic acid and calcium as well as vitamins A, C and K. The butter and cream aid absorption of the fat-soluble vitamins (A, D, E and K). Gently heat the oil and butter in a large pan, add the onion and garlic and cook until softened. Add the mushrooms and cook for five minutes before adding the spinach, stock and seasoning. Simmer for about 15 minutes and purée until smooth. Add the cream, stirring well and serve. 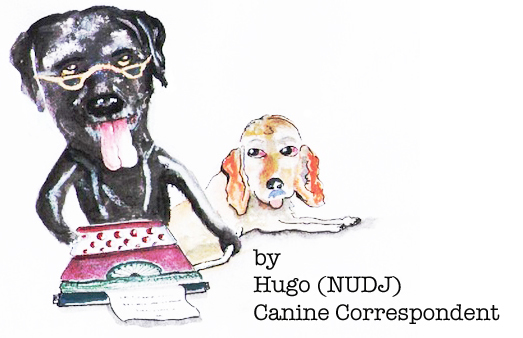 This entry was posted in Hugo blogs, Nutritional information, Soup and tagged cream of mushroom soup, dog journalist, healthy soup, nutritional facts mushrooms, nutritional facts spinach, spinach soup. Bookmark the permalink. Ha!!!! I’m rolling. Sorry Hugo. I do hope you don’t go to the dry cleaner as well. Poor Java, hope she is feeling better soon, I am sure you are doing your part to help her. And Bossy makes some fabulous soup, love the combination, a real health boost and warming bowl of goodness. That hurts just thinking about it I don’t think I want to go to the dry cleaners!! The soup looks delicious. I understand Gerlinde because neither do I. I’ll tell Bossy that you said her soup looks delicious – she’ll be pleased because I wasn’t very complimentary. Hugo. I’ve missed you Hugo. Happy 2015 – what a beautiful soup to start the year with. Happy 2015 to you too Sally. 🙂 Personally I would rather start the year with a big tournedos and without a whiny puppy, but you know, horses for courses etc. I hope you’re well. Love Hugo. Poor Java, so glad you are comforting her Hugo. Sounds like you have a soft spot for her after all? Hello Stacey! I wouldn’t say I have a soft spot – I’m a very muscly dog, but I put up with her… Love from Hugo. Happy to hear Hugo that you are as sassy and self-obsessed as usual in 2015. You’re too funny! But poor old Java though. Hope she’s on the mend. Bless. Still, less interference in getting this beautiful soup posted. Sounds healthy but a touch decadent. 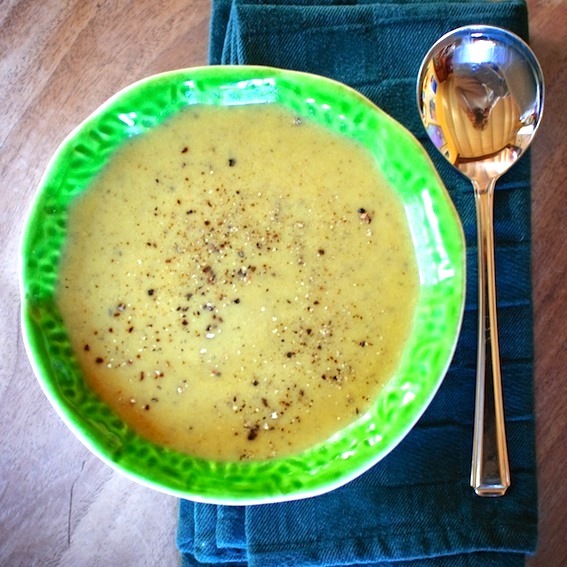 Perfect January potage! Thank you Kellie, err I think 😉 You’re right, when Java’s out of sorts, I have more time to concentrate on my work. She’s definitely on the mend now though! Love Hugo. Yet again I turned to one of your recipes for our no school Wednesday lunch. My children are not crazy about mushrooms, but they adored this soup, it is delicious, the mushroom flavour delicate rather than overpowering – yet another success story from you – thank you!